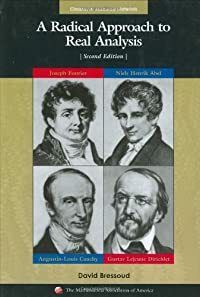 The National Research Council of the National Academies has just released the preliminary version of its report, The Mathematical Sciences in 2025 . This was produced in response to a request from the National Science Foundation. 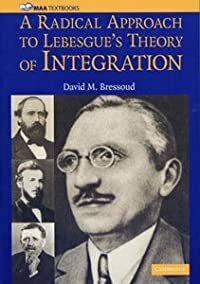 It comes as the latest in a series of glimpses into the future of mathematics that go back to the “David reports” of 1984 and 1990 [2,3] and the “Odom study” of 1998 . This report is important because it will influence the direction NSF takes as it plans for the future. The emphasis of the report is on the central role that the mathematical sciences are taking within research in areas as diverse as biology, finance, and climate science. Traditional disciplinary boundaries are blurring. There is an increasing need for scientists who are well grounded in mathematical sciences, especially the statistical and computational sciences, as well as other disciplines. This goes two ways. It means opening courses and programs in the mathematical sciences, especially at the graduate level, to those in other fields of study, and it means ensuring that students graduating in the mathematical sciences are prepared to work in this interdisciplinary world. The report also stresses the importance of attracting more women and students from traditionally underrepresented minorities to the mathematical societies. This is the one place where I disagree with the report, for it asserts that, “While there has been progress in the last 10–20 years, the fraction of women and minorities in the mathematical sciences drops with each step up the career ladder.” (NRC 2013, p. S-10). I don’t question the drop. I question whether there has been progress over the last 10–20 years. 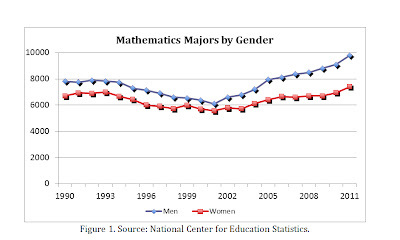 If we look at mathematics majors (bachelor’s degrees) by gender, we see that over the period 1990 to 2011 the number of men majoring in mathematics grew by 25% while the number of women grew by only 10% (Figure 1). As a result, the percentage of bachelor’s degrees in the mathematical sciences going to women has dropped to 43.1%, the first time it has been this low since 1981. This is having knock-on effects for graduate programs. 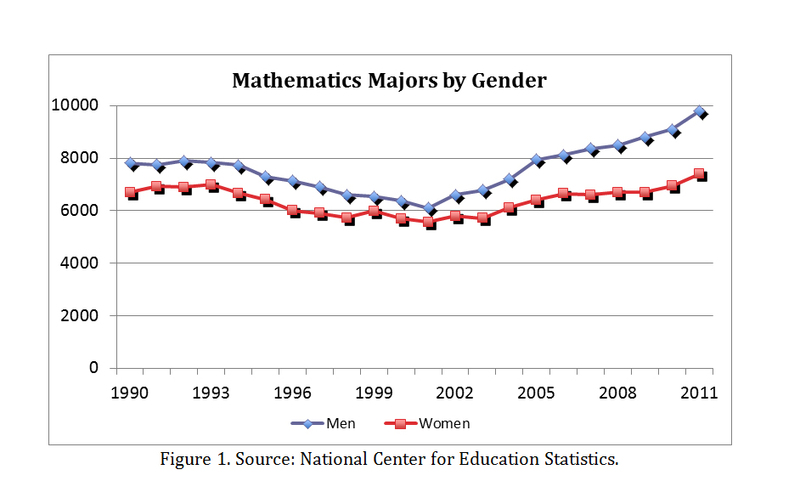 The percentage of bachelor’s degrees in mathematics that went to women peaked in 1999 at 47.8%. The percentage of master’s degrees in mathematics that went to women peaked in 2004 at 45.1% and has since dropped back to 40.9%. The percentage of doctoral degrees in mathematics that went to women peaked in 2008 and ’09 at 31.0%. It has since dropped back to 28.6%. The good news is that the past decade has seen strong growth in the number of mathematics majors, but two-thirds of the growth since 2001 has been in the number of men. We see an even more discouraging pattern among Black students (Figure 2). The number of Black mathematics majors is essentially back to where it was twenty years ago despite the number of bachelor’s degrees earned by Black students almost tripling over this period. 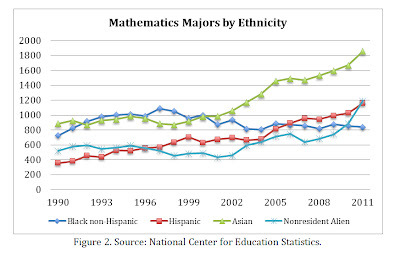 The number of Black mathematics majors peaked in 1997 at 1,089. It was back down to only 840 in 2011. 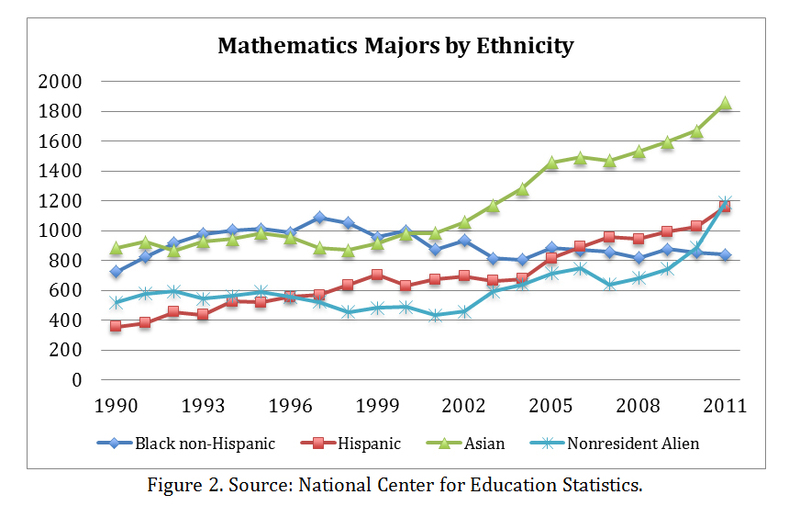 The number of ethnically Asian mathematics majors has been growing strongly over the past decade. Even so, the number earning undergraduate degrees in the mathematical sciences has only doubled since 1990, while the number earning bachelor’s degrees has tripled. The growth in the number of Hispanic mathematics majors looks good, having slightly more than tripled in twenty years, until you realize that the number of Hispanic students graduating from college is almost five times what it was in 1990 (154,000 versus 33,000). Where we do see strong growth, especially since 2007, is in the number of non-resident aliens majoring in mathematics, which now stands at 7% of all US mathematics majors. I have only touched on a few of the topics covered in the NRC report. It also discusses the increasingly important role of the mathematical sciences institutes, the issue of maintaining online repositories of mathematical research such as arXive, and the threats to mathematics departments as more instruction—especially for the service courses that often provide the justification for a large mathematics faculty—is moved online. This is a report well worth reading and pondering. National Research Council. 2013. The MathematicalSciences in 2025. Washington, DC. The National Academies Press. NRC. 1984, Renewing US Mathematics: Critical Resource for the Future. Washington, DC. The National Academies Press. NRC. 1990. 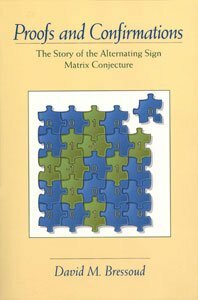 Renewing US Mathematics: A Plan for the 1990s. Washington, DC. The National Academies Press. NSF. 1998. Report of the Senior Assessment Panel for the International Assessment of the US Mathematical Sciences. Arlington, VA. National Science Foundation.